Invest in your children's fitness and health today, with our island-wide kids/youth fitness programs - conducted gym-less, right at your location - here in Singapore! For concerned parents who like to help their child or teenager fight childhood obesity, or to get them simply moving again! Also, for parents who want their kids/youths to develop a life-long passion for active living, physical activity, and all things fitness and health. Tapping on our knowledge and experience as trained physical educators, we will design for your child a customized fitness program just for him/her. Using fun-filled, movement-based activities, games and challenges, we will put your child on the path to health, fitness and well-being. 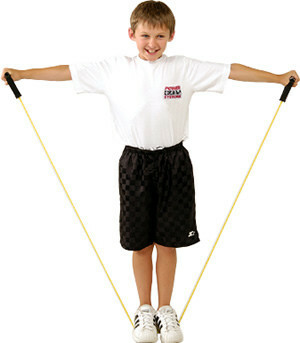 Our kids/youth fitness program is conducted as a full-fledged One-On-One Personal Training Program. Depending on your child's actual physical age and level of maturity, some components as listed in our Personal Training Description Guide may also apply to him/her. Click on our Fitness Rates/Charges to find out more. We provide kids/youth fitness training throughout Singapore from Mondays to Sundays at flexible and negotiable timings. We start as early as 6am and end as late as 10pm. However, all slots are on a first-come-first-serve, by-appointment-only basis, and are subject to availability. Are we FIT to be your child's Fitness Mentor? You bet! In fact, we are the ONLY Singapore fitness provider who offers proof, verification and validation of our fitness credentials. Check out for yourself who we are and our range of fitness qualifications and experience. please do check up our Kids/Youth Fitness Program FAQs Page to see if your query has already been addressed. If you cannot find what you want, please feel free to check through our General FAQs Page or even contact us directly.